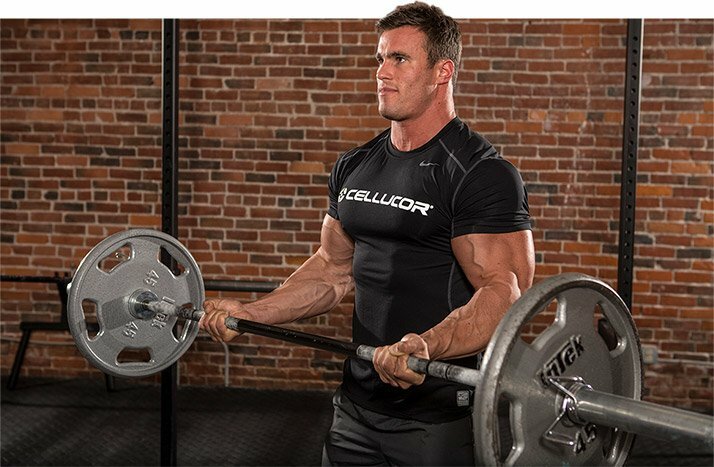 Build a set of Golden Age arms with this old-school, no-holds-barred video workout from Calum von Moger. Let the gains begin! I'm not interested in looking like today's bodybuilders. I prefer the classic physiques of guys like Arnold Schwarzenegger, Dave Draper, and Franco Columbu. They had incredible symmetry, great proportions, and amazing overall development. Those are guys I want to look like—but maybe just a little bit better. In this workout, I'm going to hit arms with an old-school approach to help you build a set of Golden Age guns, from tall biceps peaks to dense, horseshoe triceps. We're going to put on mass and carve out shape. Our goal isn't just size. We're going to build size, aesthetics, proportion, and balance. I thrive on pushing myself to that next level—breaking past plateaus and goals I've set and adding on the reps. If I have it in me, I'll keep going. You're not going to grow if you don't push yourself to the next level. If you want to see results, you have to kick up your training. Integrate this workout into your program once or twice each week to keep your arms growing. This workout is a simple, six-exercise breakdown: three exercises for your biceps and three exercises for your triceps. Start out with higher reps of 12-15 to warm the muscles up, and then taper your reps to the muscle-building range of 6-12 reps for 4-5 sets. Heavy weight and ample volume will ensure a killer pump. I like to add mass with compound movements and carve with isolation exercises. Start with the compound moves—they're the best way to work on the mass and the size of your arms—and finish with isolation exercises for detail, cuts, and that added pop. I didn't have a gym membership until I was 18 or 19 years old. All we had was a barbell, some weights, and some dumbbells. All I knew were barbell curls. Today, they're still one of my favorite exercises. I think barbell curls are a great exercise to start an arms workout because you have to employ coordination and balance. There's no isolation and no machine to rely on, which helps you develop core and overall strength. I think barbell curls are a great exercise to start an arms workout because you have to employ coordination and balance. Concentrate on good form—elbows tight to the pad, no swinging, no momentum&Mdash;and a great stretch on the preacher curl. At the top of this isolation exercise, remember to squeeze your biceps as hard as possible for the ultimate pump. Stay focused. Just going through the motion won't get you the physiques of classic bodybuilding champs. Build your mind-muscle connection. Doing so will give you more control and a lasting pump you can feel. Don't be afraid to play around with your grip to help hit your biceps from different angles. 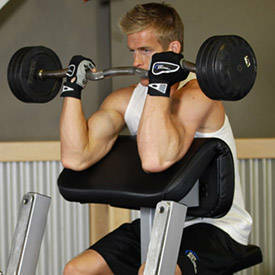 I like to finish my biceps with the concentration curl. It's a great isolation exercise that will stretch your biceps and help build high peaks. I like to do them while standing for the added resistance. When it comes to the concentration curl, contract with as much force as possible, but remember to control the eccentric (lowering) part of the movement. You never want to swing down or simply drop the dumbbell. Keep your elbows as close to your body as possible, and keep them fixed once you get the weight up. I like to bring the bar to my forehead to get a bigger stretch out of my triceps. Explode on the way up and stay controlled on the way down. Don't always feel like you have to stick to a specific number of sets and reps. You may use any workout template as a guideline, but once in a while you have to break the rules and go beyond your "assigned number." Challenge yourself and grow! To really hammer the long head of your triceps, you need to get your arms over your head. Maintain control as you lower the dumbbell behind your head, go down as far as you can to get a really good stretch, and extend all the way at the top. You want the last few reps on your final set to leave you completely gassed. 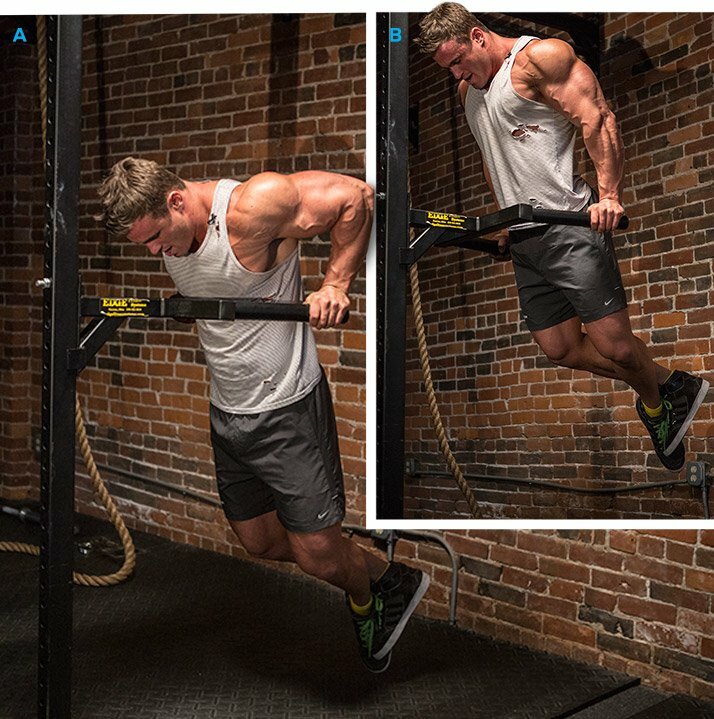 Dips are a great finishing exercise. Your triceps are already fatigued, and dips give them that extra, final push. Increase the intensity as needed by increasing the rep count and limiting your rest period. Attack as many reps as you possibly can, no matter how tired you are. Not sure if you're training arms hard enough? Take this test: At the end of your workout, try and touch your shoulders. If your biceps are so pumped up you can't reach them, you've done your job well. If you easily get a hand on each deltoid, you need to keep pushing.